...it made the fit at the shoulders change near the neck. This is why it's so important to do a fit test with any alterations you make: a change in position of the arms makes the shape of the shoulders different. Edits like this can ripple though the entire pattern. 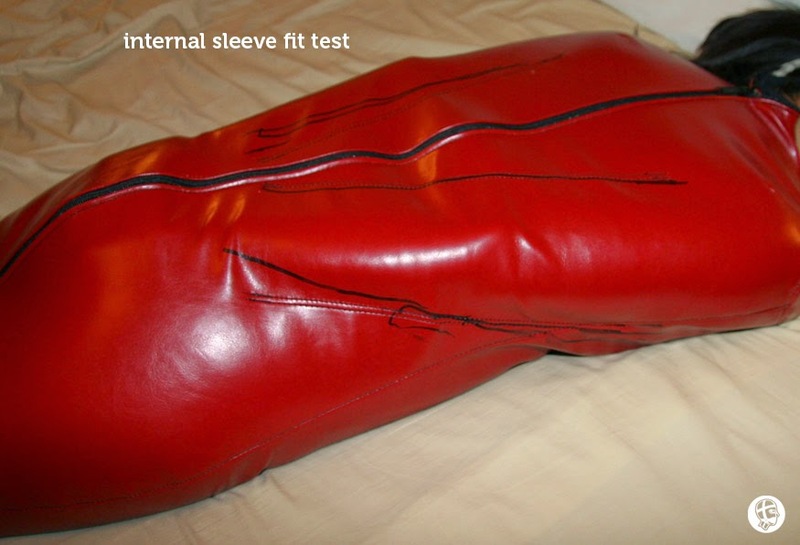 So if you still want a skin tight fit, you may have to make adjustments along the way. The whole leg pocket fit was unchanged from the last time. Next time: you get to see how it all turned out. P.S. Merry Christmas and Happy New Year to all my leather-crafty friends and pervy readers all over the world. Here's to a happy and healthy 2015! I wish also a happy new year. Thank you for all your posts here! All the best during 2015! The red vinyl looks really festive. May I ask what type of vinyl you use to prototype? Thanks AR80! The vinyl is something I picked up in the garment district in downtown LA. I don't see any identifying markings, but many stores carry similar vinyl in that area. Chris your fukkin with my head again.